Just a few months ago, wildlife rarely ventured into Navegaon, a once-bustling farming community in central India. But today, the village boasts a thriving ecosystem home to a variety of native species, save one -- humans. 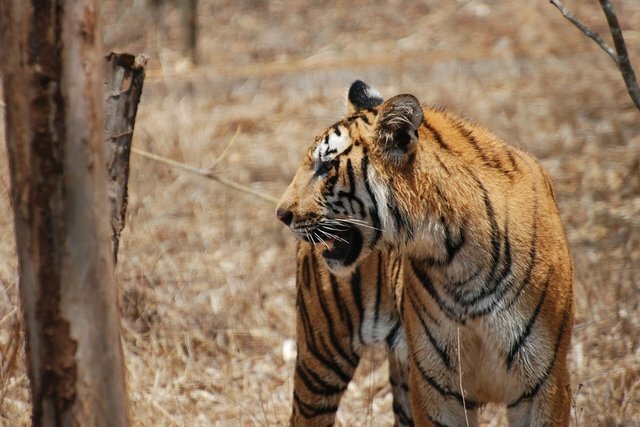 In an effort to make room for Nature, the 200 families that once lived in Navegaon agreed to leave, allowing the surrounding Tadoba Tiger Reserve to envelope it. The move was part of an ongoing plan on the part the Indian government to widen fragile ecological zones by encouraging nearby villages to relocate. And in recently vacated Navegaon, the plan is clearly working. A little over two months after the last person moved out, a whole host of animals that had formerly been kept at bay have moved in. "Before Navegaon was shifted, there were sporadic sightings of leopards and tigers near the village. However, post relocation, carnivores and even herbivores are regularly seen in the 400 acre area that has become inviolate," wildlife warden Bandu Dhotre tells the Times of India. "Now carnivores can prey on herbivores in the same area without coming into conflict with humans. This is the best part of relocation." So far, almost a hundred villages have agreed to relocate for the widening of wildlife reserves across India, creating crucial buffers to ease tensions between humans and animals -- a remarkable concession for the right of Nature to exist unfettered.